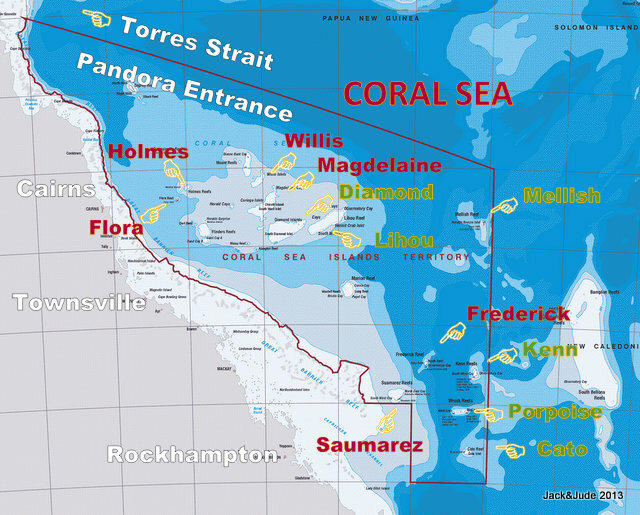 There is a new Coral Sea Cruising Guide online that I think will interest all sailors crossing the Pacific to Australia, and all sailors wanting an faster, alternative route north to Torres Strait. The sailing yacht Banyandah first crossed the Coral Sea in 1974 stopping at a couple of the very remote coral atolls that had basic islets. Later in the 80s we did quite a few voyages throughout this lovely part of the world and simply loved the raw nature, great diving and superb fishing. This year, while making a passage to Cape York, we retraced many of our old routes stopping at several new atolls also. We have produced a Cruising Guide detailing all the anchorages, of which there are many safe places to stay as long as you like in the trade wind season. It's online to peruse, or you can download an enhanced version with many more photos and historical notes, plus details on shipwrecks, which is available in three formats to suit all readers.